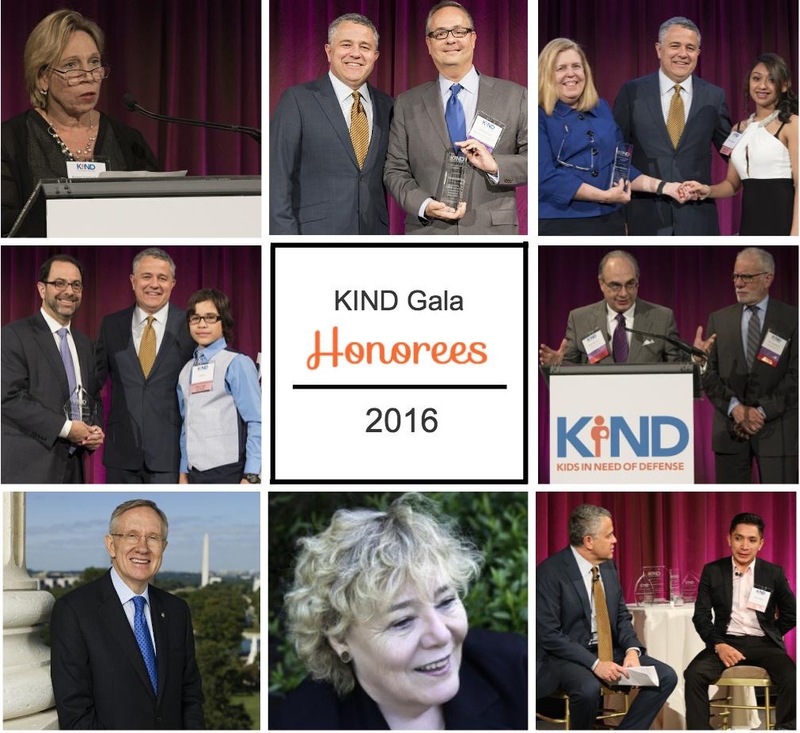 KIND’s 2016 Gala Dinner was a tremendous success, thanks to all who attended, and to our honorees— and particularly to the young clients who spoke and shared their difficult stories with us. Jeffrey Toobin, staff writer for the New Yorker and senior legal analyst at CNN, was our host for the evening, and introduced KIND Board Chair and Microsoft President and Chief Legal Officer Brad Smith and KIND President Wendy Young. KIND President Wendy Young noted that thanks to our pro bono attorneys, “thousands of children will obtain protection and be free to live without fear of deportation back to the conditions they fled.” She added that, “the safety of refugee and immigrant children knows no borders” and highlighted KIND’s protection work in the region through KIND’s return and reintegration project and work on refugee resettlement. You can watch Brad and Wendy’s opening remarks here. From top left: Karen Frederiksen, Associate General Counsel, The Walt Disney Company; Jeff Toobin and Mark Kirsch, Partner, Gibson, Dunn & Crutcher; Vilia Hayes, Partner, Hughes Hubbard & Reed LLP with Jeff Toobin and Karen, a former child client; Gary Wingens, Chairman and Managing Partner, Lowenstein Sandler LLP with Jeff Toobin and Fareth, a former child client; Raul Herrara and Ronald Schechter, both Partners at Arnold & Porter LLP; Senator Harry Reid; Congresswoman Zoe Lofgren; and Jeff Toobin interviewing Israel, a former child client. The Walt Disney Company’s Associate General Counsel Karen Frederiksen accepted KIND’s 2016 Innovation Award on behalf of the firm. Disney stood behind KIND in times of crisis—starting during the child migration crisis of the summer of 2014—in offering support in California, one of the states most impacted by that unprecedented surge. Disney is increasing its support to KIND and unaccompanied children by expanding its work to our New York office. Disney also created a video describing their work and that of KIND. KIND presented the 2016 Allegiance Awards to Gibson, Dunn & Crutcher LLP and Hughes Hubbard & Reed LLP. Partner Mark Kirsch accepted the award on behalf of Gibson Dunn, which in addition to representing significant numbers of children, held enormously successful intake clinics, including a “mega-clinic”, and will soon host a bi-coastal one—without these clinics, many children would have never known that they may be eligible for protection and fallen through the cracks or been forced to face court alone. The firm was also an important partner in an innovative and successful effort to increase funding for representation of unaccompanied children in California. Partner Vilia Hayes accepted the Allegiance on behalf of Hughes Hubbard. The firm has taken particularly complex cases, which they won with a combination of talent, deep dedication, and creativity. The firm has also created an efficient and effective internal model for KIND cases which helps them move more quickly and has built the firm’s in-house expertise and team building. In addition, the firm is notable for the significant participation of its newest lawyers, many of whom stay involved as support for more junior lawyers. Long-time KIND partner Lowenstein Sandler LLP received KIND’s 2016 Founder Award. Gary Wingens, Chairman and Managing Partner of the firm and a member of the KIND Board of Directors, accepted the award. Lowenstein client, 12-year-old Fareth, who fled brutal gang violence in Honduras with his sister when he was only nine years old, and who the firm helped gain U.S. protection, spoke on stage, and described his experiences. KIND honored Arnold & Porter with our 2016 Vision Award. 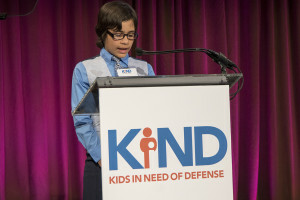 KIND has been urging greater protection for children in the Northern Triangle of Central America, and was gratified when the Obama Administration announced the launch of a program in late 2014 that would allow children to apply for U.S. protection from their home country. KIND quickly recognized, however, that these vulnerable children would face many of the same challenges that unaccompanied children in the U.S. do—the inability to navigate a complex legal system alone. Long-time partner Arnold & Porter stepped up to meet this challenge. The firm is helping KIND implement an innovative pro bono support program for children seeking protection through the in-country refugee-processing program. It has recruited more than a dozen top law firms in Honduras, El Salvador, and Guatemala to provide pro bono legal representation to interested children. Partner Raul Herrera and Partner and KIND Board Member Ron Schechter accepted the award on behalf of the firm. Senator Minority Lead Harry Reid and Representative Zoe Lofgren received KIND’s Vision award for their introduction of the “Fair Day in Court for Kids Act”, which mandates representation for unaccompanied children. Click here to see Senator Reid’s remarks, and here for Representative Lofgren. Jeffrey Toobin interviewed Israel Mateo, a young man who fled Guatemala at the age of 15. Israel experienced what no child should have to go through: his father and uncle were both shot to death, his uncle burned to death, and his brother stabbed. When Israel refused to sell drugs for the narco-traffickers in his town he was beaten so badly he had to seek medical treatment. This is when Israel fled to the U.S. Now, Israel is an extremely dedicated student in 11th grade with numerous awards and looking forward to attend college. Click here to watch the full Q&A with Israel and Jeff Toobin. In addition, world-renowned violinist, Tim Fain, played two powerful pieces that brought people to their feet. Overall, it was a memorable night celebrating the invaluable work of our pro bono partners and supporters on behalf of these children every day, and of the resilience and strength of the children we serve.